Billy Dettlaff was born and raised in Oshkosh, Wisconsin, the son of Henry (Hank) and Helen Dettlaff. His father came to the game of golf as a nine-year-old caddie in 1907. After serving in the US Army during World War I he returned home to Oshkosh. In 1921 he was named the first golf professional at the new municipal 9-hole golf course in Oshkosh. He would spend the next 35 years serving the local community at Lakeshore Municipal Golf Course. Hank was an excellent player and teacher who played on the early PGA Tour for a number of years, including appearances in the Western Open, the 1934 US Open, and the 1934 PGA Championship. In 1954 he captured the Wisconsin PGA Senior Championship. Having taught thousands of caddies and players his most famous student was Johnny Revolta, 1935 PGA Champion, two-time Ryder Cup player and PGA Hall of Fame Member. Revolta dedicated his highly recognized instruction book, 'Johnny Revolta's Short Cuts to Better Golf' to the game and Dettlaff. Billy was born in 1950 and grew up in the game to follow in his father’s footsteps. After his father's death in 1956 his mother kept golf and his father’s memory alive in his life. As a teenager he worked in the clubhouse at Lakeshore, as a caddie at Lakeshore and Oshkosh Country Club, and on the golf course maintenance crews at both locations. He earned a Bachelor of Science Degree majoring in Journalism and minoring in Radio-TV-Film at the University of Wisconsin – Oshkosh. While there he won a number of national journalism awards. Following college he worked for five years in suburban Chicago journalism at the Free Press Newspaper Group. He is a member of Sigma Delta Chi - The Society of Professional Journalists. In 1978 he left the newspaper business to pursue his dream of being a PGA club professional. His career started in November of that year at Inverrary Country Club in Lauderhill, Florida, home of the Jackie Gleason Inverrary Classic. Quickly moving through the PGA Apprentice Program he gained PGA membership in 1981, then attained the PGA’s highest classification of Master Professional in 1988. Billy has been active in the PGA serving on Chapter, Section, and National levels, has been recognized with numerous honors and awards, and has served PGA Education on the Adjunct Faculty. Billy was the Head Professional at Inverrary from 1981 through 1987. He worked for the PGA Tour’s TPC Network for 22 years as a Director of Golf/General Manager at TPC Eagle Trace in Coral Springs, FL, TPC Michigan in Dearborn, MI, TPC Jasna Polana in Princeton, NJ, and TPC Sawgrass in Ponte Vedra Beach, FL. When he retired from the PGA Tour in 2009 he was the TPC Network's National Director of Golf based at TPC Sawgrass. He wrote his first book in 2007 entitled 'A Storyteller's Guide – THE PLAYERS and TPC Sawgrass' for the PGA Tour. It was released in 2007 in a limited edition of 1,000 leather bound copies and a slipcased paperback edition of 30,000 copies. Now out of print both editions are often found on popular online resale book sites. 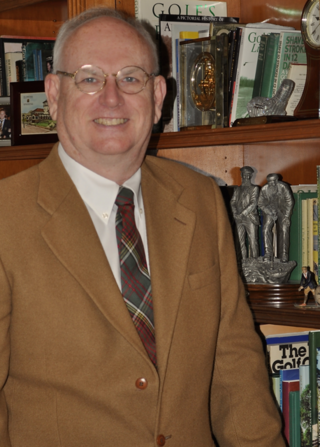 Since retiring he has been researching and writing the first definitive history solely dedicated to the golf profession. It traces the development of the game in Scotland, the creation of the game’s supportive artisan talents of club and ball making, the founding of the caddie position, and the eventual combination of these skills with a superior talent to play the game. The successful combination of these skills led to the recognition of the first golf professional in the person of Allan Robertson of St. Andrews, Scotland, in the early 1840s. The book continues forward to present day by examining the development of the game through the remarkable contributions of the golf professional. It touches upon the socio-economic influences as the game spread throughout the world, and on the game’s development over the past 175 years. It tells the story of advancement through biographies of well-known and lesser-known professionals who exemplify what is great about golf and the profession. A greatly abridged version served as the text for the PGA of America's 2015 centennial book - 'The Official Centennial Commorative Book: Celebrating the History of the Golf Professional'. The full tome, entitled "Doctors of the Game", was officially released in September 2016 at the Golf Collectors' Society Annual Meeting & Trade Show. Its 696 pages are printed in a five-color process on 100 lb Garda Silk paper imported from Italy. Quality and attention to detail was invested on every page. It was been released in three cover formats starting at $200 - a remarkable value considering the quality and size of the book. It was a finalist in the USGA's prestigious Herbert Warren Wind Book Award for books published in 2016.